Friends of Wonder Valley: The Friends of Wonder Valley has formed. 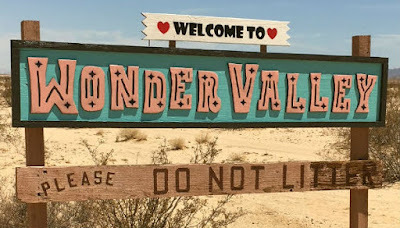 The Friends of Wonder Valley has formed. We have dreamed for many years of forming an organization that would allow us to collect funds legally and with accountability, and then distribute those funds to the benefit of Wonder Valley, California. People here are generous and many, many people have given to the Community with cash and in kind donations, and with their time as volunteers. Just last month two community members stepped forward to pay Bob Stephenson to film the County Fire meeting so that everyone could watch it on YouTube. Putting together a nonprofit has been a daunting task, and for some time we looked for an existing charity to sponsor us. When it came down to it, it seemed the best way was to do it ourselves. The Friends of Wonder Valley, a 501(c)(3) nonprofit, was incorporated with the State of California on July 5, 2018. We had our first board meeting on August 8, 2018, elected officers, and ratified our bylaws. On August 26, we filed with the IRS for tax exempt status. Raise funds to make the Wonder Valley Community Center as useful to the community of Wonder Valley as possible. Maintain a fund that covers the costs of qualified meetings and events for those who cannot afford to pay the fees or purchase insurance. A qualified meeting or event is open to the public, duly noticed, non-sectarian, not aligned with a political party, cause, or candidate, and should support one or more goals of the WVCC. We bought an insurance policy this year that allows us to sponsor community meetings, waiving the $80-120 insurance required for community meetings. We also registered with the County as a local charity and have been able to cover the facility fees, as well, for many meetings. It gives us great pleasure to see the Wonder Valley Community Center being used to provide programs that engage residents and build community, including arts, music, theater, education, food, health, and recreation. Go to the About Us tab above to review all of our Goals.